While much of the news about IT innovation focuses on public cloud computing, the on-premise data center is also being transformed by new technologies. CIOs have recognized that infrastructure complexity has inhibited their ability to rapidly provision resources for new workloads, and now they're adopting a variety of converged systems to overcome their legacy constraints. 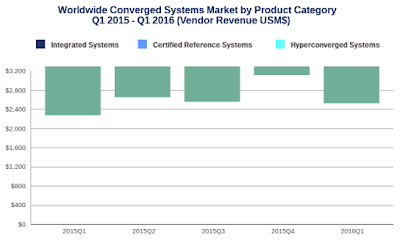 According to the latest worldwide market study by International Data Corporation (IDC), the converged systems market increased revenue 11 percent year-over-year to $2.5 billion during the first quarter of 2016. The market generated 1,367 petabytes of new storage capacity shipments during the quarter, which was up 36.2 percent compared to the same period a year ago. "End users within the mid-market and even in the outer edge of the enterprise data center continue to prioritize simplicity in all aspect of the user experience. This is at the heart of the rapid growth rate within hyper-converged systems." said Kevin Permenter, senior research analyst at IDC. Going forward, IDC believes the IT vendors that can present the end user with a seamless and simple end-to-end experience will be well-positioned for further growth. However, those that do not adapt to the new business model will continue to experience market share erosion. Integrated systems are pre-integrated, vendor-certified systems containing server hardware, disk storage systems, networking equipment, and basic element/systems management software. Like integrated systems, certified reference systems are pre-integrated, vendor-certified systems containing server hardware, disk storage systems, networking equipment, and basic element/systems management software. Certified reference systems, however, are designed with systems from multiple technology vendors. Hyperconverged systems collapse core storage and compute functionality into a single, highly virtualized solution. A key characteristic of hyperconverged systems that differentiate these solutions from other integrated systems is their ability to provide all compute and storage functions through the same server-based resources. During the first quarter of 2016, the Integrated Systems market generated revenues of $1584.25 million, which represented a year-over-year increase of 1.8 percent and 62.8 percent of the total market value. EMC was the largest supplier of Integrated Systems with $403.90 million in sales, or 25.5 percent share of the market segment. Certified Reference Systems sales rose 0.3 percent year over year during the first quarter of 2016, generating $567.95 million worth of sales. This amounted to 22.5 percent of the total market value. Cisco/NetApp was the top-ranked supplier of Certified Reference Systems in the quarter, generating revenues of $336.72 million and capturing a 46.86 percent share of the market segment. 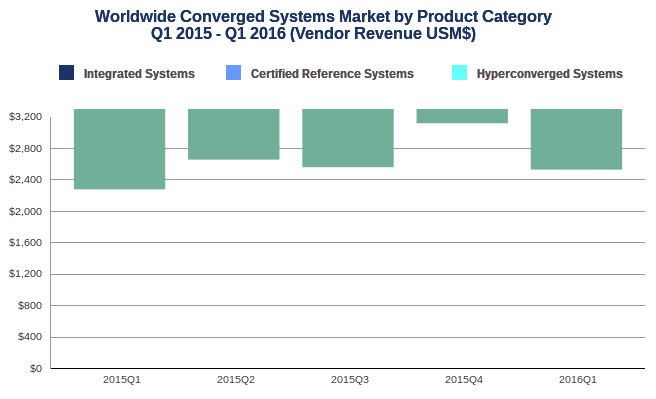 Hyperconverged Systems sales grew by 148 percent year over year during the first quarter of 2016, generating $371.88 million worth of sales. This amounted to 14.7 percent of the total market value.